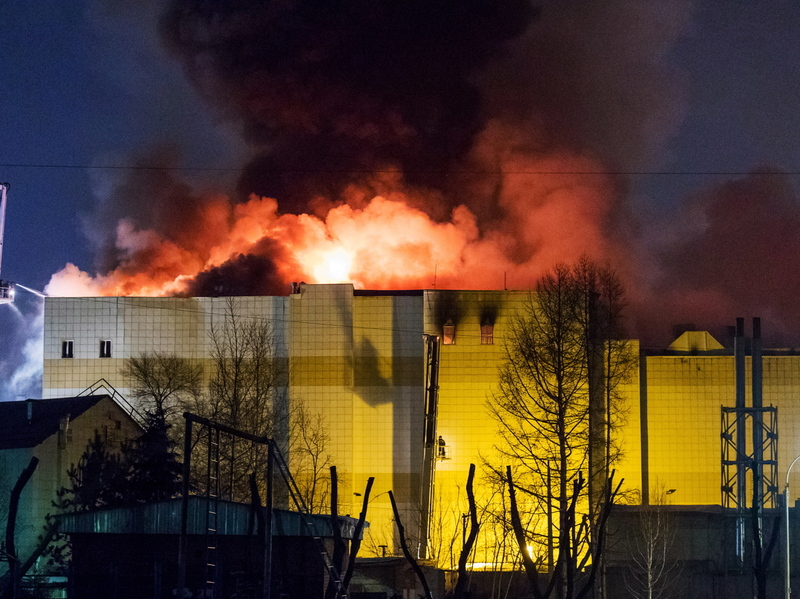 At Least 64 Dead In Shopping Mall Fire In Central Russia : The Two-Way Authorities says some people are still missing after the blaze in the city of Kemerovo, about 2,200 miles east of Moscow. Flames rise from the Zimnyaya Vishnya shopping center in Kemerovo, where at least 64 people have died. At least 64 people have died in a massive fire at a shopping center in central Russia, while others remain unaccounted for, a Russian official confirmed Monday. NPR's Lucian Kim, reporting from Moscow, says many children are thought to be among the dead. The fire — among the deadliest in years in Russia — has been extinguished, emergency officials said, but rescuers were having difficulty reaching the upper floors of the building because of a roof collapse. According to news reports, the alarm system did not work and some fire exits were blocked. Television footage showed people trying to break down jammed emergency exits and some jumping out of windows as black and white smoke billowed from the Winter Cherry shopping complex, Reuters reports. The Moscow Times quotes Russian news agencies as saying more than 100 people were evacuated from the building in the city of Kemerovo, in Kemerovo Oblast, a coal-producing region about 2,200 miles east of Moscow. TASS and Interfax said more than 100 people had been evacuated from the burning mall, which contains cinemas, restaurants and shops. There was no immediate indication of the cause of the fire. However, Reuters said: "Russian state investigators said four people had been detained over the fire, including the owners and leasers of outlets inside the shopping mall. The Investigative Committee, which handles major crimes, said it was trying to bring in the mall's principal owner for questioning." A previous version of this story gave the shopping center's name as Wild Cherry. The correct name is Winter Cherry.